The easiest way to print from your smartphone or tablet with or without a router or local wireless network. Simply set up and connect the HP ENVY 5660 wireless printer to your local network and the Internet, wirelessly—right from your smartphone, tablet, or PC. Print borderless, lab-quality photos and laser-quality text with this all in one printer—at speeds that keep up with your family. Print 4x6-inch photos from your mobile device without switching paper, using the separate photo paper tray. Main functions of this HP all in one printer: copy, scan, wireless printing, two-sided duplex printing, color touchscreen, Instant Ink ready. Borderless photos are printed right to the edge of the paper. You get beautiful photo prints with no trimming. Scan to email: Save time by sending scanned documents or photos directly from your printer to email recipients. Print, scan, or copy quickly and easily with the 2.65-inch color touchscreen. Use Original HP 62 ink cartridges to print up to 2x the pages as refilled cartridges. Paper sizes supported: Letter, legal, 4x6 in, 5x7 in, 8x10 in, No. 10 envelopes. What's in the box: HP ENVY 5660 e-All-in-One, HP 62 Black Ink Cartridge, HP 62 Tri-color Ink Cartridge, Software CD, Setup Instructions, Power cord. Photo - 4" x 6"; A4 - 8.30" x 11.70"; Letter - 8.50" x 11"; Legal - 8.50" x 14"; 5" x 7"; Envelope No. 10; 8" x 10"; 3" x 5"; Custom Size; 8.50" x 11.69"
Fast printing at a great value. Easily create lab-quality photos and laser-quality text on the go4—right from your smartphones and tablets. This e-all-in-one is designed to help the whole family be creative, stay productive, and save time. Windows 10, 8.1, 8, 7: 1 GHz 32-bit (x86) or 64-bit (x64) processor, 2 GB available hard disk space, CD-ROM/DVD drive or Internet connection, USB port, Internet Explorer. Windows Vista: 800 MHz 32-bit (x86) or 64-bit (x64) processor, 2 GB available hard disk space, CD-ROM/DVD drive or Internet connection, USB port, Internet Explorer. Windows XP SP3 or higher (32-bit only): any Intel® Pentium® II, Celeron® or 233 MHz compatible processor, 850 MB available hard disk space, CD-ROM/DVD drive or Internet connection, USB port, Internet Explorer 6. 2 Either after first page or after first set of ISO test pages. For details see hp.com/go/printerclaims. 3 HP recommends that the number of printed pages per month be within the stated range for optimum device performance, based on factors including supplies replacement. 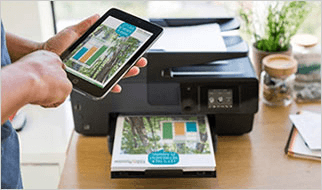 4 Local printing requires mobile device and printer to be on the same wireless network or have a direct wireless connection. Wireless performance is dependent on physical environment and distance from access point. Wireless operations are compatible with 2.4 GHz operations only. Remote printing requires an Internet connection to an HP web-connected printer. App or software and HP ePrint account registration may also be required. Wireless broadband use requires separately purchased service contract for mobile devices. Check with service provider for coverage and availability in your area. See http://www.hp.com/go/mobileprinting for more details. 5 Wireless performance is dependent on physical environment and distance from access point. Wireless operations are compatible with 2.4 GHz routers only. 6 Savings claim is based on HP Instant Ink Service plan price for 12 months using all pages in plan without purchase of additional pages compared to the cost per page (CPP) of the majority of color inkjet printers <$399 USD, market share reported by IDC Q3 2013. CPP comparisons for standard capacity inkjet supplies are based on estimated street price and page yield as reported by Gap Intelligence MFP Weekly and IJP Weekly Reports Q3 2013. Actual savings may vary depending on number of pages actually printed per month and content of pages printed. Requires internet connection to printer, valid credit/debit card, email address, and delivery service in your geographic area. 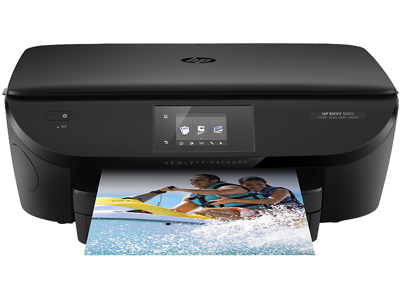 7 Based on plan usage (without excessive printing), Internet connection to a compatible HP printer, valid credit/debit card, email address, and delivery service in your geographic location. 9 Power requirements are based on the country/region where the printer is sold. Do not convert operating voltages. This will damage the printer and void the product warranty.